Interview with Stephanie Dodier, a Clinical Nutritionist and Emotional Eating Expert, chatting about building up compassion for your body as you work to overcome binge eating, including whether or not to avoid binge-inducing foods, how to navigate binging and food sensitivities, learning how to treat yourself after a binge, and so much more. The podcast is partnered with Wolfe Clinic Royal Flora, my choice in soil-based probiotics. Get 20% off your soil-based probiotics with the coupon code GUT at checkout. Thrive Market 35% savings – get an instant 35% off your favorite premium organic products. All you have to do is enter your email address, and the discount will be applied to your cart! 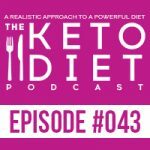 Leanne Vogel: You’re listening to Episode Number 43 of The Keto Diet Podcast. Today we’re chatting about problems behind restrictive dieting, five deficiencies that can lead to binge eating, and steps to becoming conscious in a binge, so stay tuned. Hey, I’m Leanne from HealthfulPursuit.com and this is The Keto Diet Podcast where we’re busting through the restrictive mentality of a traditional ketogenic diet to uncover the life you crave. What’s keto? Keto is a low carb high fat diet where we’re switching from a sugar burning state to becoming fat burning machines. All listeners of the podcast receive a free seven-day keto meal plan complete with a shopping list and everything you need to chow down on keto for seven whole days. Download your free copy at HealthfulPursuit.com/ketomeal. The link will also be in the show notes for today’s episode. Perfect if your daily keto meals have become a bit lackluster, if you’re new to keto and a bit lost when it comes to eating what and how much, or thrive on being guided on what to do and when to do it. Again, that’s healthfulpursuit.com/ketomeal. Let’s get this party started. Hey, guys. Happy Sunday. The following has nothing to do with keto, well, a little bit because it’s Coconut but I just want to share with you guys that we got a new dog. She’s a red doberman, her name is Coconut and she’s been with our family now for four weeks and we couldn’t be happier. Now we have three loving, amazing dogs, and yeah, the dogs outnumber the people but we run a very tight ship here in the Healthful Pursuit household and nothing really flies. She joined the family and got integrated very well and her little sisters have been showing her what to do and what not to do and things are going really well. I know that a lot of you say that you want little life updates from me so that’s what’s going on in our life and we’re really happy. We named her Coconut because it’s so fitting. If you met her you would see that she’s totally a coconut. The show notes and full transcript for today’s episode can be found at healthfulpursuit.com/podcast/e43. The transcript is added to the post about three to five days following the initial air date of this episode so anything that we chat about in today’s episode whether it be a resource or a link, it will be in the show notes. Let’s hear from one of our awesome partners. The show is partnered up with Paleovalley, the makers of the only 100% grass-fed and finished fermented beef stick. Each stick contains 1 billion probiotic CFUs. We all know how important fermented foods are to the health of our gut and the strength of our immune system. Chowing down on Paleovalley’s fermented beef sticks provides your body with all of the beneficial bacteria it loves in one convenient little beef stick. Their gut-friendly sticks are gluten-free, soy-free, dairy-free, GMO-free, freaky chemical additive, dye, and preservative free, as well as being 100% free from carbs and sugar, and made with the highest quality ingredients. Exclusive to listeners of this show receive instant savings of 20% off Paleovalley fermented beef stick snacks by going to Paleovalley.com/keto. And if your jaw is just tired thinking about beef jerky, it’s worth noting that these tasty treats are not tough at all, but moist with a little snap. The summer sausage flavor even tastes like those Hickory summer sausages, but without the gunk. Seriously delicious. Again that’s Paleovalley.com/keto for an instant 20% off savings. If you have an idea for a podcast episode or you want to submit praise over and above the review which you can leave by going to HealthfulPursuit.com/review, you can reach me at info@ketodietpodcast.com. I have one announcement, I will be going on another book tour starting very soon, like next month. I will be going to over ten places sprinkled all through the U.S. and Canada and I’m so stoked to be heading back on tour to meet you, chat, sign your book. If you don’t already have a copy of The Keto Diet which is my paperback, you can pick one up at the event and I’ll sign it. I’ll do a talk, I’ll answer your questions. It’s always a good time. You can head to ketodietbook.com/tour to RSVP. There are couple of locations where we’re running out on space so if you haven’t RSVP and you’re kind of thinking about going, you’re not sure, just RSVP. I would highly recommend if I’m going to your city, check it out at ketodietbook.com/tour. See if I’m headed your way. If I’m not, I’m really sorry. Maybe in the future? So we’ll see about that but definitely head on over to ketodietbook.com/tour to RSVP and I can’t wait to meet you and Kevin will be there too so we’re both really excited to see you. Our guest today, her name is Stephanie Dodier. She’s a clinical nutritionist, weight loss and emotional eating expert, author of The Crave Cure program, and she’s a speaker and host of The Beyond the Food Show. Stephanie’s integrative and comprehensive approach to nutrition focuses on finding the root causes of your cravings and aligning your body and mind. Stephanie and I met at Paleo FX a couple of years ago. She came to my Healthful Pursuit dinner and I just loved her energy and her attitude toward eating and seemed like she knew a lot of things. Then I checked her out online and sure enough she knew a lot of things. She recently did an Instagram story on the five deficiencies that can lead to binge eating. I watched the whole thing and I messaged her, I was like, “Girl, you got to come on the podcast.” Here we are. Without further adieu, let’s cut over to it. Hey, Stephanie. How is it going? Stephanie Dodier: Fabulous. Very excited about today. Leanne Vogel: Awesome. I’m so, so happy to have you on the show. We met actually in Texas at a dinner about a year ago and I just loved our conversation. I watched your Instagram stories all the time and I’m just so happy to have you here, to chat with all of our people about emotional eating and cravings and binging and all the things. Stephanie Dodier: I’m excited to share my own experience and what I’ve learned in working with people in the context of working with women specifically in relationship to food. Let’s dive right into this. Leanne Vogel: Cool, for listeners that may not be familiar with your work, why don’t you start off by telling us a little bit about yourself? Stephanie Dodier: Absolutely. I am a clinical nutritionist and that to me is the second life so we were talking early about mid-life crisis. I had my mid-life crisis at the age of 36 where my health completely collapsed following a very intense career in the corporate world. I needed solutions to heal myself and I didn’t want to do the medication anti-anxiety stuff so I went down the path of natural healing and then I started to find therapies to help me in food and nutrition so I quit my gig in the corporate world and I went back to school and I became a nutritionist. Now I help women with their relationship to food because what I found through my own healing is that food is yes important but there’s so much more beyond the food that actually we need to work on to get a permanent and complete healing. Leanne Vogel: Amazing. 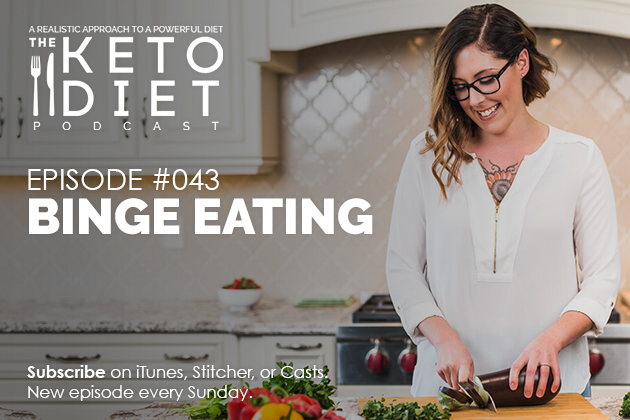 I think specifically and we’re chatting about this before we started recording is specially in the ketogenic community or any of these, “strict eating styles,” whether it be vegan or vegetarian or keto or low carb or even paleo. I remember when we were doing the paleo thing. Leanne Vogel: It’s like it’s my way or the highway, this is the only way to do it and if it’s not working, clearly it’s me screwing it up and I just need to be stricter. Leanne Vogel: That can cause a lot of problems so let’s chat about the problems it can cause first. Stephanie Dodier: Absolutely. First hand, living through those problems is my own story, right? I started my journey thinking that weight was my issue so I went, dive into the paleo diet like stricter and militant, like everybody who’s eating grain was a bad person. It allowed me to lose weight but then I started to have all kinds of cravings and then I started digging into why this was happening. That’s when I discovered that there was more than food and part of my control that I was actually exercising on food is because I wasn’t looking on the other elements beyond the food as far as healing my weight issue, my hormonal issue, my anxiety issue. Just to give the listener a brief understanding of going beyond the food, we’re talking about here your mindset, the way to talk to yourself, the way you relate with caring for your body beyond the food, like your relationship to exercising, your relationship to your partner in life, were you in an abusive relationship or you’re in a loving relationship, so all those element that go beyond the food. In fact, as per science, exercise as much if not more power than food has on our body. Nobody’s ever explained that to me until I tripped over the information and started to discover the other component and more for me, more I was going down the paleo way and that’s how I tripped over keto. That’s how I actually discovered you Leanne, is wanting to be even stricter on my paleo. Stephanie Dodier: Yeah, I was the expert of the keto, was teaching it and the whole thing and then I’m like my hormones are still out of whack and I’m still not at the weight goal I want to be at, there has to be more into food. Then I did somehow keto, this whole path of wanting to be stricter with my food lead me to actually discover and searching that there was more than just food, if that makes sense. Leanne Vogel: That’s really what my path was too, like The Keto Beginning, my first program was really like, “Let’s be strict to lose weight together.” Then I was like, “Oh shoot. That doesn’t work.” Then I did Fat Fueled like, “Hey, guys. Maybe being super strict isn’t working out and it didn’t work for me, but hey, if you dig deeper and figure out what this is all about …and that’s very much what we’re going to talk about today is digging deeper beyond the food and why something, “isn’t working,” and that’s what I really discovered. Once I figured that out, life became a lot easier when I focused on not only just the macros but how food makes me feel, what emotions bring me to certain types of food and how relations influence my health and my mental health and how my mental health is connected to the foods that I’m choosing. I mean, it’s all intertwined and I think if we don’t have this conversation, we’re really doing ourselves a disservice because it’s about so much more than just the diet solving all of your problems. Stephanie Dodier: Absolutely. I’m laughing here because before we go further, I’m going to use the words beyond the food a lot and the reason for that is because that’s my podcast and it’s called Beyond the Food, so I just want to put it out there before people say like, “What the heck is she saying Beyond the Food all the time?” I got it out, we’re not going to talk about it anymore. Leanne Vogel: That’s amazing. What was that process for you? Before we dig in to like what it means to go beyond the food, I know a lot of people will listen to what we’re about to share and be like, “I can’t do that. How? How do we even do that?” What was that process like for you? Because people share their stories and it sounds like one day they were screwed up and then the next day they were totally fine. What did that process look like for you to going beyond the food? How long did it take you to get here right now? Stephanie Dodier: Six years ago I was in hospital wired from head to toe thinking I was going to die of a heart attack, not understanding anything about beyond calories and fat is bad for you. That’s where I was six years ago and today, six years down the road and trust me, a lot of ups and downs and curl in a ball in the living room floor and just crying, five or six like heavy 300-page journal of me just journaling my life, I’m here today and I’m here today and I meditate every day and I do like practices to connect my mind and my body and I still have ups and downs. The last three days was like I didn’t go on social media because I needed to work some stuff personally. Was it called a down? I don’t call it a down anymore, but for most people, it was a down and that’s six years down the project of working on myself. Leanne Vogel: I think it’s really good that people that share information online or in books or any, “health gurus,” be really honest to the fact that they are humans, like, I’m a human, and there are days where there are messy days, there are just messy days like any other person. I think sometimes I know some people that I follow, I kind of put them up on a pedestal and I think, “Oh, if only I could be like that person,” but it’s nice to hear you say like, “I’m human and stuff happens and then I just need to reassess stuff,” so I really appreciate that and I know that everyone listening will too, so thank you. Stephanie Dodier: It’s not a direct point, I guess that’s the message so it’s not like … and that’s part of the issue with food. The control we exert on food through a keto diet, a vegan diet, whatever it is, is we try with our left brain, our analytical brain to resolve a problem that actually is heart-based so the other side of the brain, right? The emotional part of the brain, that’s where our relationship to food begins and then we try to solve it from the other side of the brain and that causes us to exert even more control on food because we’re not either aware that our relationship to food begins in our heart, in our right side of the brain or because we don’t want to go there because it’s too messy. Leanne Vogel: Yeah, it can get pretty messy. Stephanie Dodier: Yeah, pretty messy. Leanne Vogel: More in my interview with Stephanie Dodier after this message from one of our podcast partners. I love being Canadian, the home of the true north, strong and free, but gosh, I’m pretty jealous of you all in the US because you get access to Thrive Market while I’m stuck with limited access to the abundance of health foods that you all know and love. We have 14-day shipping, and everything’s expensive, and forget about free shipping. That’s always out of the question. For all of my pals south of the border, my friends at Thrive Market are offering you 35% off your first box of groceries, plus free shipping and a 30-day trial so you can re-order your favorites a couple of weeks down the road. Imagine spending only $9.95 as opposed to the $20.99 on raw cacao powder or $15.65 as opposed to $24.99 on MCT oil if you go to a retail store. On top of their everyday wholesale prices, the extra 35% off your first box of organic and non-GMO products, plus free shipping is going to make a regular $100 grocery run into about a $50, maybe $75 Thrive Market order for the same amount of things. You can go to thrivemarket.com/hp to get your instant 35% off. This offer will expire in a couple of weeks, so if you’re on the fence about it, the time is now. Again, that’s thrivemarket.com/hp to get your instant 35% off. This offer is available to new Thrive Market customers only and people in the US. Wah wah. Okay, let’s chat about binging, overeating. I know that one of the tips for controlling binge eating that we hear about a lot is to not restrict ourselves and that restriction itself is what causes the binge. Is that a good method for everyone or are there people who may be actually better off restricting the very foods that they know that they will binge on? Stephanie Dodier: Absolutely, the way I look at this is, I’m going to give you an image, I’m thinking of an onion. It’s like peeling an onion and the first layer or the first peel of the onion is actually the food. For people, maybe not in this group of listeners, but the average people, the North American people who eat a lot of sugar, a lot of processed food, the first layer we need to deal with if they are binge eating or they have a difficult relationship to food is the food they choose to eat. We first need to understand, yes it does have to do with a certain level of restriction but it’s what I call the “not really food,” like the junk food, the sugar, the things that are not really food. Yes, if we eat those foods and we don’t restrict them, they will cause us to binge. White sugar for an example is demonstrated to cause an addiction in the brain and yes, you will binge on those. That’s yeah, to a certain degree food is part of it, however, if I’m thinking of the audience who’s listening to this podcast, you’re likely not eating the standard North American diet. If you are not, then the first step is to go get Leanne’s book and adopt a real whole food type of lifestyle, eliminating processed food and the sugar and the things that we know are addictive and cause binge eating. Once that layer is peeled and we are aware, you Leanne, where I live and most of the listeners live in the “real food world,” then it doesn’t have anything to do with food anymore. It has to do with that right side of the brain, the emotional part of our being. Some people will call it our soul body or spiritual body or emotional body, the answer to your binge eating lies in that part of yourself. The more control you want to exert on your keto diet, for the listener, you’ll say all dial up or I’ll dial down my macros to get even stricter so I don’t have any binge eating moment or I will lose the weight that I want to lose, the more control you exert on that side of your health, the less you’re paying attention to the emotions that are actually driving the binge eating behavior. Does that make sense? Stephanie Dodier: What we need to do to find the solution to our binge eating is actually to understand why we binge. Instead of applying control to the trigger food because that’s a common theme, right? We talk about trigger food, instead of looking at our trigger food, what I want you to look at is the trigger event, the trigger people, the trigger emotion, the trigger whatever that causes you to binge. That is where it can get messy because through that process of understanding what triggered the binge, you may discover that maybe the relationship here is not that nice, or you’re not feeling fulfilled anymore in your job, or you have a hatred for your body that every time you look at yourself or you put a bathing suit on then you will binge because you hate your body. Understanding what triggered the binge beyond the food is where it begins to find a solution to binge eating. Leanne Vogel: What are some examples of triggers, like you mentioned maybe some relationships, you mentioned some emotions or experiences. What would be a good example of a trigger that somebody would maybe look for? Stephanie Dodier: In cognitive behavior therapy we talk about like it’s a triangle, right? There’s the thoughts, a thought of some kind. For me, one example, “it’s not good enough.” When I have a list of mile-long of things to do, I desire to do it all at like a 100%. I’m a perfectionist so I want to do it all because I don’t feel that I’m good enough so I want to over perform then I feel overwhelmed. The first thought that happens into my head when I feel that overwhelm is food, particularly chips for me. The crunchy, the aggressive … right? That’s what happened in my head when I felt overwhelmed because when we feel overwhelmed, like from my example particularly, that’s different for all of your listeners, when you feel that negative emotion, it is human nature to want to feel better because feeling bad is not the human experience. It’s not what we’re meant to be, it’s not what we’re meant to feel like, so the body will go and you’ve probably heard of that survival mechanism, right? Probably the listener have heard of the whole cortisol pathway, right? We are in survival. Emotionally, we have that same survival pathway. We don’t feel good, we go in survival mode, we’re going to find something that’s going to make us feel better. For some people, it’s drugs. For some people, that’s alcohol. For some people, it’s food. That’s my case and people who struggle with binge eating … is food. Very little people who have binge eating are also alcoholic because it’s not what they’re using, they are using alcohol to feel better. For people like me who struggle with binge eating, it’s food. I feel bad because I feel overwhelmed, because I want to do everything today the best that I can. I feel bad about that, I feel stress, I know that when I eat chips I feel better, momentarily, but at least I feel better because there’s a release of dopamine in the brain when you binge eat. Right? That dopamine makes you feel better. Does that help you understand? Number one deficiency is self-worth and when you don’t feel enough, you don’t feel good enough or beautiful enough, you don’t feel good, you don’t feel happy, you don’t feel fulfilled or joy, and you will go to food. In our case, to feel better. Self-worth is a cause of binge eating from that perspective. One of the things to repair, heal that or stop that behavior is actually stopping to judge ourselves, stopping to label ourselves or our behavior as “good” and “not good.” “I haven’t been eating keto today, I’ve been a bad person. I’ve had off day, I feel off the wagon.” I don’t know if you hear that but I hear that a lot in my world. Leanne Vogel: Yeah, I just did a podcast episode on it. I just finished recording Episode 40 and it was exactly like falling off the wagon, getting back on track, yeah. Stephanie Dodier: Right? This whole thought process that you fell off the wagon, there’s no such thing as falling off the wagon. I don’t know what you said in your podcast, but like reality is there’s no such thing as falling off the wagon like we’re not off the wagon, it’s just the human experience. There’s ups and downs. Leanne Vogel: There’s no wagon. Stephanie Dodier: There you go. Leanne Vogel: There is no spoon matrix style. There’s no wagon. You created the wagon but it doesn’t exist. Stephanie Dodier: You already got a preview to that podcast. Stop labeling, stop judging, find more compassion for yourself. That’s a big deficiency that leads to binge eating. Instead of applying more control on your macros, try to find more worth for yourself. Try to work on that behavior and not being enough. The second one is self-care and that is a massive one for women and very sarcastic in a sense that we’re talking about ketogenic diet because people believe, women particularly believe that they do care for themselves because they pay so much attention to their food and they spend the time cooking specifically when you do a keto diet like you and I, Leanne, which is real food so we cook everything from scratch. People believe, women believe that “I do care for myself because I spend all this time caring for my food.” The challenge is that we are more than just food. We are an emotional being, we are spiritual being, we have relationships in our life. Do you also go into the place, and I know you’ve been there, I’ve been there, we over exercise and that is not self-care. It’s actually destroying our body, right? Because this whole behavior of I do exercise, I go to the gym six days a week and it’s because I care for myself. Actually, you’re trying to compensate and control your exercise to achieve your goal instead of looking at the other side, the emotional side and the spiritual side of your being. Self-care goes beyond just the food, it’s your relationship to exercise. The time you spend with yourself like how many minutes a day and I don’t want to say hours but how many minutes a day you spend in silence with yourself thinking? Right? We don’t do that. Self-care and deficiency in holistic approach to self-care will lead to binge eating because we don’t take care of all parts of our being. Again, going back to the fact that we’re more than just the left brain, the analytical side of ourselves but we are also emotional, spiritual being. That’s self-care. Deficiency number three is positive self-talk. That’s another big one. For people to understand this if you are not aware, we have two parts of our brain, the conscious brain and the subconscious brain. Our subconscious brain, AKA our mind is what directs 95% of our behavior in the day. Example of that, your heartbeat. Your heartbeat is not coming from the conscious part of your brain, it’s totally subconscious. You don’t have to think about beating your heart or breathing, it just happens automatically. The tape that runs in our head that self-talk, that silence part of our conversation with ourselves, if we’re not aware of that, is actually coming from our subconscious brain. You know the cassette that plays in the background all the time? It’s subconsciously there and in most of us, it’s not nice. It’s judgmental, and it’s challenging and it’s negative so if we’re not consciously aware of how we have this internal chatter with ourselves, we will run that negative self-talk in the background consistently. That, ladies, is a massive source of stress. I’m sure Leanne, you’ve talked about cortisol on many other podcasts and it leads to so many hormonal dysregulation, and that was me. I was this clinical nutritionist and I knew all the supplements, I was doing saliva testing like three to four times a year and I had everything like food dialed up. The only thing that wasn’t dialed up in my life was my internal chatter and that’s when I discovered meditation, and it changed my world but as soon as I started to care for this background noise I was constantly playing in the back of my mind, causing me to stress because it was constantly telling me I wasn’t good enough, the stress level went down and my cortisol pattern and rhythm became back to normal. This is how powerful that cassette that plays in the back of your head can have. That’s number three which is positive self-talk. Then the fourth one is the love for body and body image. How many times a day do we pass in front of a mirror and take a selfie, look at ourselves, and judge ourselves? I’ve counted it one day, I don’t know if you’ve ever done the exercise, Leanne, but it was 15 times. Leanne Vogel: Okay, yeah I think I may have done it more in the past but I mean, I was laying in bed the other day and I eaten a really, really large meal with my family and I was wearing these cut off shorts and I was just letting my belly fly. I was just full. There was this voice in the back of my head that said, “You should care about how you look right now.” I was literally in bed, the lights were off and I didn’t care and it was like what? No, oh wow, I stopped caring like it was this moment of just I really don’t care. Yeah, I’m sure like a couple of years ago, I used to take so many pictures of myself in the mirror like all the time, different angles and I’d lift up my shirt even if I was going to the bathroom I’d like lift up my shirt, tuck my belly in all different areas and then go to the bathroom and as I was like sitting on the toilet I’d be beating myself up over the I don’t know, extra macadamia nut I had four days ago. Stephanie Dodier: Yes, sister. Right? Stephanie Dodier: Constantly. Think about that ladies, how many times a day do you do that to yourself? Would you say that to your best friend? Never, right? You wouldn’t say what you said to yourself sitting on the bathroom or me standing in front of a mirror when I get dressed up in the morning. I would never say those words to anyone. The impact of the words you choose when you look at yourself in the mirror and you care and you label 99% of the time when we have body image issues, trust me, it’s not an overwhelming positive feeling towards your body, right? It’s because we hate the image we’re receiving in the mirror. We put a lot of importance and value to that because that’s what we believe is going to bring us that positive effect because most of us have been raised in a space or have been led to believe that more severe, more judgmental we are towards ourselves, the better behavior we’ll have. We’ve learned that behavior somewhere that when we beat ourselves, we’re going to change our habits, we’re going to transform, we’re going to stop doing this because we’re so rough on ourselves. Our parents in most cases did that, not meaning to do this bad thing to us but that’s the way they were raised. They continue this behavior and then we do that to ourselves. We beat ourselves up because that’s the way we’re going to learn. Guess what? It doesn’t work. We now know that with children that’s not how we raise children or we say that’s not the way children should be raised because they don’t actually learn the right behavior that way. They are just scared, it’s fear so what we need to do is learn to have a better relationship with ourselves and with time, learn to love our body the way it is because all that negative self-talk that we do towards our body actually raises the level of stress in our body and hormones and neurotransmitters and all the chemistry in our body is actually modified by the negative self-talk we have towards our body. Leanne Vogel: When we’re stressed out cortisol and is increasing, you’re not going to be generating many ketones so it kind of goes hand in hand. Stephanie Dodier: Right. You can be at 15 grams of carbs a day but if you have that background noise playing, it has nothing to do with the diet, has to do with the way you treat yourself when you’re in front of a mirror or taking a selfie of yourself. I think we’ve all been there, right? Compassion requires you to actually ask yourself the question like, “Why did I do that? What was I trying to protect myself from? What was I trying to make myself feel better for? Did I simply overeat because I chose to overeat?” and I move on because that happens, too. Leanne Vogel: Yeah, totally does. It totally happens, yeah. Stephanie Dodier: There’s nothing bad about that because self-compassion requires you to not label your behavior as good or bad. They are just behaviors. Once you understand the reason, the trigger and the emotional level behind it, then you just have a big hugging moment with yourself. Guess what? People are scared and I used to be scared that if I was nice with myself, if I was compassionate with myself I would just binge even more. And yes, it may happen in times where you really put yourself in that work place or working the other side, the other aspect of your healing, there might be a period where you may binge more because you are in that period of adaptation of learning to look at life from that other angle. You just don’t know how to behave from that perspective, but that will pass. You will go back to a space where you eat when you’re hungry and that’s the beautiful thing, when you are willing to be compassionate with yourself and you’re asking the question as to why am I behaving like this and what’s causing emotionally that behavior, you will get to a place where you will heal and actually correct the element in your life that causes that behavior and binging will just literally no joke, vanish because you don’t have the triggers no more, right? More in my interview with Stephanie Dodier after this message from one of our podcast partners. The podcast is partnered with Wolfe Clinic Royal Flora, my choice in soil-based probiotics. Soil-based probiotics are a fabulously effective approach to repopulating the gut. The soil-based organisms are cultured in declayed plant matter free from pesticides, chemicals and toxins. Unlike conventional probiotics, which have a shortened shelf life, are vulnerable to stomach acid, weakened by processing methods, and less likely to reconstitute or colonize the GI tract the level we need it, soil-based probiotics are alive and thriving, meaning they colonize along the entire GI tract, rapidly forming into the bacteria your body needs most as soon as it interacts with saliva. Soil-based probiotics from Wolfe Clinic called Royal Flora is my choice in soil-based probiotic, and my gut has never felt less bloated. I’m not reacting to foods in the way that I used to, for example, spaghetti squash. I can eat it. No problem. It’s great. 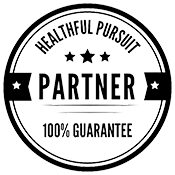 U.S. and Canadian listeners receive 20% off when you order from HealthfulPursuit.com/gut. Use the coupon code GUT all in caps, no spaces for the 20% discount to be applied to your order. What happens if you’re doing this work, you’re digging deep and because you’re human, you’re probably going to binge again between now and when you figure a little bit out. What should one do if they are halfway through a binge and they are like, “Shoot,” and they become conscious, because I know when I was binging, maybe it’s a little bit different because I had bulimia where I would completely black out. I wouldn’t even be conscious in my body or anything and then I’d be done the binge and the purge and the whole bit. For somebody that is binging, they’re conscious to the binge, are there any tools or strategies one could use when they are right in the binge and they are like they become conscious to the fact that they are doing what they are doing? Stephanie Dodier: Absolutely. In my world, I call that the Crave Cure Formula. It’s a four step process that we actually learn a breathing technique. The pausing moment you’re talking about, that moment of awareness that you’re now binging, it’s the solution. You’re 50% of the way there because you’re actually are aware that you’re binging. Take the time to be with your food. The first step is I’m not going to teach you to breathe because when you’re in the middle of the binge, you’re not going to stop to do a breathing exercise, right? Be conscious of the pizza you’re overeating. For me, it was the chips. When you start being conscious of actually eating the chip like turn off the TV and eat the chip like you feel how salty it is and how disgusting it is in your mouth. That’s the first step, be aware, be with your binge instead of being somewhere else. Try to bring the awareness back to that binging situation that you’re in and if you can, after or when you can pause the binge, is actually to start feeling the emotion that you’re running away from, because I don’t know about you but for me when I binge, I typically run away from something. Feeling that, what you’re trying to run away through your food, is the element that will tip over with the time and with practice, the binging behavior, because you will be able to feel the emotion without having a numbing element. Because when we binge, we don’t want to feel something, we want to feel better because we are afraid of that feeling so we’re numbing with that binging behavior. Part of the process of healing is actually learning to be with that feeling and learning that it’s not going to kill us. It’s not going to cause us to die, it’s not going to cause us to collapse. Feeling the emotion is just that it’s an emotion, it’s an energy but the first step is awareness and the second step is feeling it. Once you get to a place where you’re comfortable doing that, the breathing exercise that I talk about in the Crave Cure Formula is actually where you’re going to learn to overcome this emotion and be comfortable with the emotion. A breathing technique that I teach is very simply through in and out through the nose. There’s a reason why we do that through the nose, it’s because there is a receptor into the nose that will actually help you pause that stressed feeling because when we binge, we don’t feel good about something, we are stressed. If I was to measure your cortisol at that moment, it’s off to the roof, because of the binging behavior, because of the emotion you’re feeling that you’re trying to numb or cover so what we need to do through that breathing technique is actually take you off that fight or flight, that overly stressed to bring you back down. I use that same technique when we talk about simple craving. Again, when we crave, we are at a higher state of stress. The first place to bring you back to a level where you can be aware and stop the behavior is actually to get you off that stress element through a breathing technique. In and out by the nose, for most people when we begin to breathe like this, we need to close our eyes because we need to concentrate on our breathing behavior. For most people, within a minute of breathing or two, depending how stressed you are, you will come off that stressed behavior, that height of your stress, that fight or flight place and you will be coming back down to a normal stress level which will allow you to be present with yourself and to be present to the reason why you’re craving chips or you’re craving chocolate is because of X, Y, Z, you’re truly not hungry. Then you’re going to learn what we call riding the wave which is actually to feel the emotion and realize that this emotion is not there forever, that it washes away. If you’ve done any type of therapy around disordered eating, you’ve probably heard of that concept of riding the wave and learning that emotion that you’re feeling is just an energy. It comes up to warn you, it’s actually a message from your body to warn you that something is not good and it washes away as soon as you’ve attuned to it, as soon as you felt it, heard it, acknowledged it, it will start washing away. I know I’ve been talking a lot here. Leanne Vogel: No, it’s brilliant. I love it. Okay, I’ll take over for a second. Yeah, it’s so true. It’s so true. You take some water. So many knowledge bombs I don’t even know where to start. I was like frantically writing down questions and trying to wrap my head around all the pieces and it’s a trick that I’ve learned that’s been really helpful for me and it may work for some people is usually I call it being snacky. Being snacky for me means that I’m not actually hungry, I just, I’m trying to soothe myself usually before bed. Especially on Tuesdays when I record the podcast like I am sitting for probably almost 12 hours recording podcasts and working and I’m not getting up, there’s very limited self-care. I know on Tuesdays, Tuesday night specifically, I’m going to be really snacky and I use that as a way to soothe myself. Usually when I’m snacky and not actually hungry, I have no idea what I want to eat, I just know I need something. Leanne Vogel: When I’m hungry I’m like, “Nope, I want steak,” like it’s very clear what I want but when I’m snacky it’s like, “Well, I could have this or I could combine this and this, I mean I could have popcorn and an apple at the very same time.” That’s when I know you’re not actually hungry … You’re just … Usually it’s comfort because it’s just been a really long day and I just want to feel something good and I know that food will give me that very quickly. Leanne Vogel: Shut your mouth right now. I’m like, “Don’t talk to me,” or like, “Are you calling me fat?” He’s been so good. Now he just like he knows better than to say anything and he just waits for my stomach to hurt because I overate and then he’s just like, “It’s okay. It’s okay,” right, because he just knows to stay out of it. Leanne Vogel: Right?! I need to put a sticky note somewhere like on the fridge or something and be like, “Are you hungry?” or, “Do you know what you want right now? Because if you don’t you’re probably not hungry.” I think that that has been such a huge lesson for me and just can kind of help you determine just off the top without having to get too deep into things yet if it’s really overwhelming to you. Leanne Vogel: If you’re thinking of a bunch of different foods that you can combine or the fact that you can’t decide on one thing it’s probably because it’s not actually that you’re hungry. Stephanie Dodier: You’re totally right and that’s the first thing we learn is physical hunger versus emotional hunger, right? There’s like massive differences between the two like an emotional hunger is sudden, it’s like typically for like not “good food,” like snacky food and it’s like obsessive. When you want emotionally eat like you’re focused, “I’m going to find something to eat.” It’s not like I can carry on doing something and then I need to eat later. It’s like you’re wanting to eat, that is pure emotional eating. Leanne Vogel: Yeah, let’s chat a little bit about binging and stuff when it comes to dietary restrictions. How does someone with a tendency to binge eat cope with having many dietary restrictions due to maybe allergies or healing protocols or just wanting to do best by their bodies? Obviously we know that better food choices and portions are those that will make us and our bodies function better, but if we stray away from those options … How do we navigate the landscape of binging when it comes to dietary restrictions? Because often times dietary restrictions like we’ve been saying can cause binging. Stephanie Dodier: It’s a fact of life. Stephanie Dodier: Right? It’s a fact of life. What I want to say to people and for myself as well, I had a lot of dietary restriction, when I lifted the other side of healing like I spent four years solely on managing food as a way of healing myself and I had a ton of restriction at that point. When I started to lift the veil on the other side and started to heal the other part, slowly and gradually, the restriction that I needed to impose to myself actually got less and less. Trust me, there’s no science on that because nobody is looking at that yet but there’s a strong correlation with food intolerances and emotional health. I believe that part of this has to do with leaky gut, and don’t want to pitch my podcast again, but if you go back to my podcast I did an interview with a doctor that actually studied that the relationship to gut healing was actually the lack of boundary of people and he’s putting out science behind that right now. Coming back to your question of restriction eating and binge eating, the number one thing is to understand that part of your restriction that you are at this point in your life are do due in part to the other side of healing. Understand that and be aware of that and start the process of working on that aspect of yourself and then two, don’t see them as a restriction but start seeing them as healing yourself because it’s just a choice of words but it will make the whole difference in the world if “I can’t have that,” versus “I choose not to have that.” I don’t know if you’ve ever done this exercise but it’s very powerful. Leanne Vogel: Yes, I do it all the time. Stephanie Dodier: I choose not to eat flours and gluten because when I do, I feel bloated and I feel crappy for the next two days like literally depressed. When I go out and I verbalize my choice with people I don’t say, “I can’t have bread,” it’s, “I choose not to have bread because it doesn’t make me feel good.” The way you express your restriction has an impact on your emotion, it has an impact of the way you’re going to feel about them. As you tag along to working on healing the other side, this emotional and spiritual body at the same time, be careful of choice of words you use and yes you have to respect your restriction but don’t expect perfection and that’s the last element of this. It’s not going to kill you if you have, I don’t know, tomato if you are on AIP protocol for the last three months and you have tomato after three months. It’s not going to kill you. Perfection actually is going to make sicker so realize that 98% is as good as 100% when you are at that stage of your healing. Is that good? Stephanie Dodier: It’s a very simple answer and people will say, “Wow that’s …” but here it is, is because you’re trying to be perfect and you’re judging yourself. Sabotage will not happen if you don’t label that behavior as self-sabotage, do you know what I’m saying? If you don’t expect perfect from yourself, if you expect to be a human being and to have a moment where things are not going so well. You may have, I don’t know, a piece of chocolate, if you don’t have chocolate, whatever it is, and that’s okay and you’re not judging the behavior and you’re being compassionate towards yourself, then we don’t call that self-sabotage do we? Then when we don’t call it self-sabotage, we don’t get into the vicious circle of shame and guilt and then like binging, right? Because now we’ve been such a bad person we felt so terrible about ourselves that now we just got to binge, right? Might as well max it out and then be a bad person because tomorrow morning we’re going back on that strict wagon of 100%. That happen to me all the time. Stephanie Dodier: Might as well screw it up because I screwed it up already, right? Leanne Vogel: It’s so brilliant that you say that, I’ve never really put two and two together like I don’t feel like I’ve sabotaged myself for a really long time and I think it’s because I don’t hold myself up on this perfection of perfectness that I used to and it’s like, it is what it is. If I eat too much and I’m too full then I don’t binge anymore to satisfy that. Leanne Vogel: It’s the whole, “Well, if I screwed up I may as well just throw in the towel today and I’ll start again tomorrow,” that whole thing. Leanne Vogel: OH yeah, bring it on. Stephanie Dodier: Might as well have it because I’ll never have it again, right? I remember like I used to be able to eat two bags of chips in one night like barbecue and salt and vinegar because I’ll never have chips again. Might as well max it out and have as much as I can because I got to be perfect for the rest of my life after. Leanne Vogel: Emotional eating and binging has a lot of negative connotation and something that I’ve learned specifically lately is, in order for me to accept my behavior, sometimes I do binge. When I’m snacky sometimes I do have those things and I’m like, “shoot.” What are some ways that if, I guess if you have binged or you accept that, “Yes, I want to emotionally eat,” like is that okay? Leanne Vogel: I want to emotionally eat, I don’t even care. Stephanie Dodier: Yeah, because we are human and that’s what differs us, it makes us different from animals we have emotion and innately from the moment we are born, our relationship to food is emotional. When we eat to like the breast of our mother or the bottle, we automatically get an association of comfort with food, like we’re being held, we’re being close to our mother, it’s warm and we eat. Often children don’t cry really to eat, they cry to get comfort. From the moment we’re born, our relationship to food is emotional so absolutely, yes, when life is terrible and you consciously decide to emotionally eat, that’s okay. Because you do it consciously like you’re being fully aware what you’re doing, guess what, you’re going to eat a lot less. I don’t know if that’s your experience but that totally is mine. Leanne Vogel: Yes, a 100%, like I emotionally ate a couple of weeks ago and I decided I was going to have popcorn. Stephanie Dodier: Yeah, it’s like the other morning I woke up I had this entire bar of chocolate like the baking size bar in my living room table. I woke up the next morning and I realized I only ate two squares of it, and typically on Friday night when I watch a movie, I would’ve ate a lot more than that but I didn’t in the moment like I was eating the piece of chocolate, I must have put it down because I wasn’t obsessed about it. I was more focused on watching the movie and being with people I just left it there. If I had binged, trust me the whole bar of chocolate probably would’ve been gone. Come get educated about it, understand how the mind works, listen to my podcast like right now we’re in a phase where we talk about just that mindset and subconscious mind and mind like learn that piece of it the same way you’ve learned the keto diet and how, why, and why you’re doing things, go to that site, learn and start practicing small steps at a time. Understand that I’ve been there for six years, I don’t know how many years for you. You’ve been in recovery, Leanne, but it’s probably around the same time. It’s not something you’re going to fix in two weeks. Stephanie Dodier: It’s a message from your body that something is going on, right, instead of being a punishing behavior that you’re a bad girl, you’re like, “Oh something is going on. I need to re-attune.” Our craving in my world, my craving, my binge eating is a message from my body that is something is really not right right now and I got to do something instead of being a bad person. Leanne Vogel: Amazing. Stephanie, you rock. Stephanie Dodier: We could’ve talked for hours, really. Leanne Vogel: I have like … I just keep writing down questions on my laptop and it just full so we’re going to have to have you on the show again. We just touched the tip of emotional eating even. Everything that you share on your site and in your Instagram stories and everything you put out there on your podcast even it’s just so great. We’ll definitely include links in the show notes so you guys can check out Stephanie. Where else can people find you? Stephanie Dodier: I would say my website so www.StephanieDodier.com, and I would say the reason why we jive so well is we have the same food principle but we’ve known through our own story that there’s more to it and that’s what my podcast is about. We’re not talking about keto, we’re not talking about food, we’re talking about everything else but food. For your listener I would say that would be the first place I would invite them to go because it’s going to be a tag along to what you do as far as and it’s going to touch the other piece of it, right, the other side of the element. Go there first. Leanne Vogel: Amazing. Awesome. Thanks so much for coming on the show today, Stephanie. We’ll include all those links that you mentioned in the show notes which you guys can find at healthfulpursuit.com/podcast/e43. That does it for another episode of The Keto Diet Podcast. Thanks for listening in. You can follow me on Instagram by searching Healthful Pursuit where you’ll find daily keto eats and other fun things and check out all of my keto supportive programs, bundles, guides and other cool things over at healthfulpursuit.com/shop and I’ll see you next Sunday. Bye.